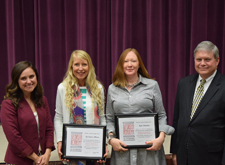 The Board of the Georgia Academy for Economic Development announces DeKalb County graduates from the 2016 Region 3 Multi-Day Training Program. Congratulations to Avondale Estates City Planner and Community Development Officer, Keri Stevens. Class participants represented a number of professional and non-professional economic development fields, including elected officials, public servants, business leaders, educators, and social service providers from ten counties in Metro Atlanta Georgia. The Academy provided each of the graduates an opportunity to gain a unique understanding of the complexities of economic and community development on the local, regional, and state levels. Created in 1993, the Academy assembles a cross section of economic development professionals and resources to provide this training in all twelve service delivery regions in Georgia. The Board of Directors of the Academy represents public and private economic development organizations and agencies from across Georgia. Since its organization, the Academy has provided training for thousands of professional and non-professional economic developers around the state, and since 1998 the Academy has been offered annually in all twelve regions of the state. Georgia EMC and Georgia Power provide facilitators for the program, and the Georgia Department of Community Affairs provides staff support to this important program. Georgia EMC’s Vice President, Community and Economic Development (CED), Pat B. Merritt, CEcD says, “Our Community Development team is proud to partner with and provide facilitation and presentation services on behalf of Georgia’s electric membership cooperatives. Involved since its inception, the team’s work with the Academy graduates has enhanced levels of leadership capacity and community development preparedness for continued economic development progress throughout the Region.” In Region 3, CED cooperative members are Cobb EMC, Coweta-Fayette EMC, Central Georgia EMC, GreyStone Power, Jackson EMC, Sawnee EMC, Snapping Shoals EMC, Walton EMC. The next Region 3 Georgia Academy for Economic Development will begin in August 2017. For more information on this, please contact John VanBrunt at 706.825.1356, or by email at john.vanbrunt@dca.ga.gov.